We offer dynamic balancing services to correct the most common cause of premature failure in rotating machinery. Unbalance is caused by the uneven distribution of mass around the axis of rotation. If you repair a machine, replace bearings, or perform other service and still experience noise and vibration, you are most likely experiencing unbalance (or imbalance). Our on-site field balancing services are for in-service equipment at your facility, whereas our shop balancing services are for components that can be brought to our shop. This includes production balancing on new components prior to being installed by a manufacturer, and various rotors that may have been removed for repair. New England SpinTech has a team of highly trained Balancing Technicians and Engineers. Depending on the application and conditions, balancing can be done at your site or in our shop. As a leading balancing service provider we are here to partner with you for all your balancing requirements. 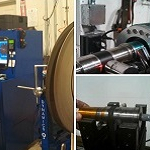 Whether you are a repair shop who has an occasional 1-off part that needs balancing or a manufacturing company requiring production balancing, our team of experienced balancing technicians are here to provide you with the highest quality precision balancing service. For those who need a fast turnaround, our emergency balancing service ensures we can turn your job around in your desired time frame. We can balance almost every type of rotating component. Our balancing machines have state of the art measuring systems and computerized print-out capability to document the balancing process and the final result. We have the capacity to balance parts weighing under one ounce up to 2,000 pounds. All balancing is performed to the industry standard for the application and part supplied. In most cases ISO standards are used. Field Balancing will correct unbalance issues right at your facility. This is done by attaching weights or grinding / drilling out material. As long as there is access to the rotor, dynamic balancing in the field eliminates the need to remove, transport to a balancing shop, and reassemble a machine, which is very labor intensive and costly. Balancing at your site in the rotor’s existing bearings and mounting structure under normal operating conditions can usually have a better end result. Lower vibration levels can sometimes be achieved with field balancing because the conditions that effect overall vibration are different when the rotor is in place.